I purchased this table for an outdoor patio restaurant lounge area. Going into our third summer with it and it is holding up beautifully. No color loss, no dents in spite of it being used in a commercial space. I would recommend it. This Panama Jack Island Breeze patio coffee table is a perfect accent to any outdoor sitting area. This table is constructed of extruded aluminum finished in a powder-coated espresso to match your outdoor decor. The table is both weather and UV resistant for maximum protection, and it is lightweight, making it easy to move when necessary. Table is as described in size and pictured. The color is spot on with the picture and not with the color description. The challenges are the leg holes not lining up properly and making it impossible to secure the 8 bolts for the ring to the legs. I kept it as it will serve it's purpose for me and it was much less expensive than other tables in this same size range and shape. I will plug the holes without screws to ensure it doesn't prematurely rust. I do feel the manufacturer should resolve this specific issue with quality control testing prior to selling more. Because the size is right for a gathering on the patio and the price beat everyone else. 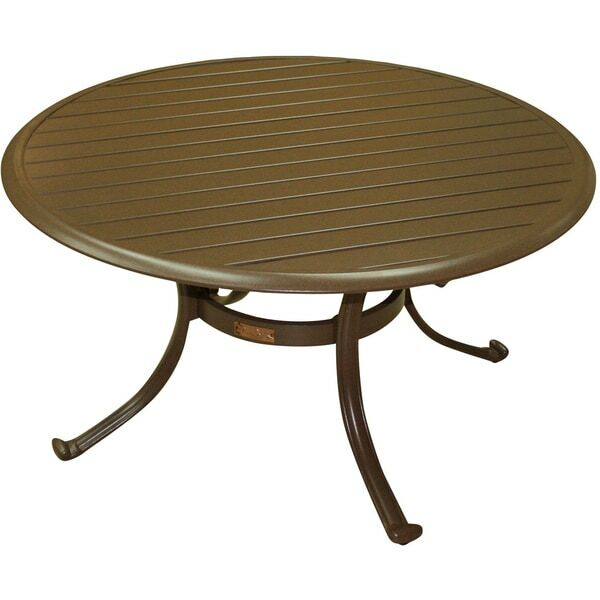 Aluminum outdoor coffee table, Biscane outdoor sets from overstock don't have white coffee table height available. Price was higher than I wanted to pay but I wanted to put it among Biscane chairs. "what is the diameter of this table?" Hello scrabble, this table is approximately 36 inches in diameter. Please let us know if you have any further questions.